Stories and poems from the Medieval era contain accounts of fearsome female Viking warriors, yet historians and anthropologists have argued that such accounts are based in myth. A DNA analysis of a 10th century skeleton found in an iconic Swedish Viking Age grave suggests there’s some truth to these old tales—and that women stood alongside men on the battlefield. 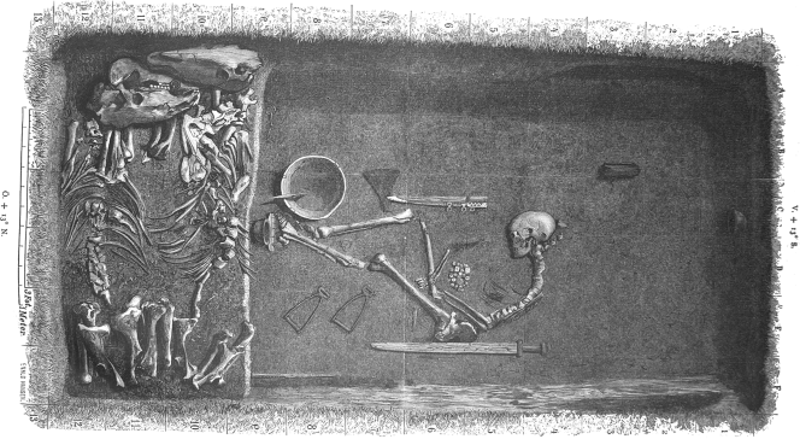 By analyzing the nuclear DNA and strontium isotopes of an individual buried at a well-known warrior’s grave from the Viking Age, researchers from the University of Uppsala have confirmed that the skeleton belonged to a female. “Written sources mention female warriors occasionally, but this is the first time that we’ve really found convincing archaeological evidence for their existence,” said Uppsala archaeologist Neil Price in a press release. This grave, known as Bj 581, was first excavated in the 1880s, and it’s considered a prime example of an elaborate high-status warrior grave. Located in the Swedish town of Birka—a key trading hub from the eighth to tenth centuries—the grave, in addition to the lone skeleton, contained a host of items indicative of a warrior, including a sword, axe, spear, battle knife, armor-piercing arrows, and two horses. Of significance, it also included a full set of gaming pieces and a gaming board—an item typically associated with a high-ranking officer. For well over a century, anthropologists and historians took it for granted that the skeleton belonged to a man, as graves like these have only previously been associated with male warriors—this despite the fact that stories had emerged during the Middle Ages about fierce Viking women fighting alongside men. Such accounts can be found in Viking art and poetry, but experts insisted that these accounts were purely mythological. But in the 1970s, a morphological analysis of the Bj 581 skeleton suggested it belonged to a female. No one bothered to follow-up on this finding owing to its apparent implausibility, and because there was no good way to confirm it. Last year, a similar analysis came to the same conclusion, prompting the Uppsala researchers to solve the mystery once and for all using genomic technologies. After extracting DNA from the skeleton, Price and his colleagues found that the individual carried a pair of X chromosomes and no Y chromosome. Isotopic analysis of her teeth suggested a high rate of geographic mobility, which was seen as further evidence of her warrior status. “Hence the individual in grave Bj 581 is the first confirmed female high-ranking Viking warrior,” wrote the researchers in the study, which was published in the American Journal of Physical Anthropology last week. Hedenstierna-Jonson and her colleagues say it’s possible that a second skeleton belonging to a male may be missing from the grave, and that the relics found in the grave belonged to this hypothetical person, but “the distribution of the grave goods within the grave, their spatial relation to the female individual and the total lack of any typically female attributed grave artefacts disputes this possibility.” Also, the skeleton doesn’t exhibit any obvious signs of injuries indicative of a warrior, but weapon-related wounds aren’t common in the Birka burials. Like so many assertions made in anthropology and archaeology, complete certainty is rarely attainable. Regardless, this study shows the power of using genomic technologies to change our understanding of the past, including issues pertaining to gender roles. A study like this also exposes our sexist biases. As noted, previous experts had blindly assumed that the body belonged to a male, which we now know was a big mistake. In their concluding remarks, the researchers warn about about these sorts of preconceived notions.